The 138MW Jeffreys Bay Wind Farm started commercial operations in July 2014. The Siemens SWT 2.3 MW wind turbines were erected using two specialised cranes. Image courtesy of Jeffreys Bay Wind Farm. The wind turbines were transported from the Port of Ngqura to the wind farm site from July 2013 to February 2014. Image courtesy of Jeffreys Bay Wind Farm. The turbines were transported in components using trucks that were more than 50m long. Image courtesy of Jeffreys Bay Wind Farm. Jeffreys Bay Wind Farm, situated between the towns of Jeffreys Bay and Humansdorp in the Eastern Cape province of South Africa, started commercial operations in July 2014. With an installed capacity of 138MW, it is regarded as one of the pioneering large wind farms in the country. The investors in the project are Globeleq (owner and operator), Mainstream Renewable Power, Thebe Investment Corporation, Old Mutual Life Assurance Company (South Africa) (OMLACSA), engineering firms Enzani Technologies and Usizo Engineering, and a local community trust named The Amandla Omoya Trust. The project received full environmental authorisation from the Department of Environmental Affairs in 2011, and construction started in December 2012. The first turbine was erected in September 2013, while 60 turbines were set in place in March 2014 and initial operations started in April of the same year. "The project received full environmental authorisation from the Department of Environmental Affairs in 2011." The wind farm is designed to generate 460GWh a year of renewable electrical energy, will serve more than 100,000 South African families, and reduce annual carbon emissions by 420,000t, averaging 8.4 million tonnes over its lifetime. At its peak, approximately 600 to 700 people were involved in the constuction, 45% of which were from the local communities in the Kouga Municipality. In addition, it created up to 11 permanent jobs. The project forms part of the South African Government’s Renewable Energy Independent Power Producer Procurement Programme (REIPP), which includes 28 renewable energy projects to be established by 2030. Financial closure for Jeffreys Bay Wind Farm, as well as two other projects in the REIPP – the 50MW photovoltaic (PV) power plant in De Aar and the 50MW PV solar farm in Droogfontein – was announced in November 2012. The combined investment for the three is estimated to be €500m ($673m). The financiers included a syndicate of lenders led by ABSA and Barclays, and included the Development Bank of Southern Africa (DBSA), certain local institutional investors, Globeleq and its consortium partners. The project site covers an area of 3,700ha, spanning across eight farms, of which the turbine components cover 4% of the land while the remaining areas are used for cultivation. 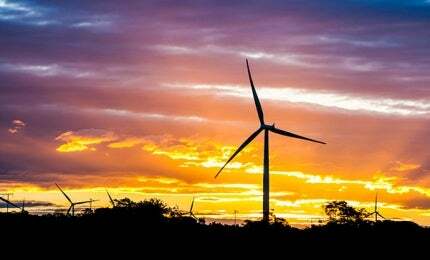 "Clean energy generated from the wind farm is fed to the neighbouring 132kV Eskom grid line." The works primarily involved the construction of the wind turbine foundations and installation of the turbines using two cranes. Other works included improvements to the access roads for transportation of the turbines to the site, construction of a substation and an operations and maintenance facility, and cabling for the substation and electrical collection system. Transportation of the wind turbines from the Port of Ngqurato to the project site started in July 2013 and was completed in February 2014, covering a total distance of 110,000km. Each of the 60 Siemens SWT 2.3MW wind turbines is 80m tall and has blades measuring 49m long. Each rotor has a diameter of 101m and weighs 60t, while each nacelle weighs 82t. The tubular steel towers weigh 162t, and the average rotation of the blades is between six and 16 revolutions per minute (rpm). Clean energy generated from the wind farm is fed to the neighbouring 132kV Eskom grid line. Escom will continue to purchase power from the farm for a period of 20 years. The first power to the grid was supplied in December 2013. Siemens, who supplied the turbines, is also responsible for maintaining them for an initial period of 10 years. The civil and electrical works were carried out by the consortium of Murray & Roberts Construction, and Consolidated Power Projects (CONCO), which also oversaw the construction of the new sub-station, roads, foundations and civil buildings, including medium and high-voltage installations. Up to 60 pad-mounted transformer kiosks (PTK), each integrating a customised 2.7MVA 33kV / 690V distribution transformer, a 33kV gas-insulated ring main unit and low voltage equipment, were supplied by ACTOM MV Switchgear. The transportation contractor for the project was Deugro, while Ingozi Management provided occupational health and safety services.